This book offers critical reflections on the intersections between criminology and queer scholarship, and charts future directions for this field. Since their development over twenty-five years ago, queer scholarship and politics have been hotly contested fields, equally embraced and dismissed. Amid calls for criminology and criminal justice institutions to respond more effectively to the injustices faced by LGBTIQ people, criminologists have recently developed a Queer Criminology and turned to queer scholarship in the process. Through a sweeping analysis of critical criminologies, as well as issues as varied as shame and utopian thought, Matthew Ball points to the many opportunities for criminology to engage further with the more politically disruptive strands of queer scholarship. 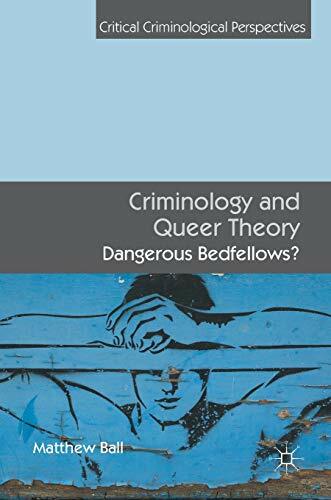 His analysis highlights that criminology and queer theory are 'dangerous bedfellows', and that navigating the tension between them is central to confronting the social and criminal injustices experienced by LGBTIQ communities. This book will be of particular interest for scholars of criminology, criminal justice, LGBTIQ studies, gender studies and critical theory. Matthew Ball is Senior Lecturer in the School of Justice, Queensland University of Technology, Australia. His research explores the intersections of queer scholarship and criminology. Matthew is a co-editor of Queering Criminology (2015) and the author of a number of other publications in Queer Criminology. 1. Criminology and Queer Theory : Dangerous Bedfellows?